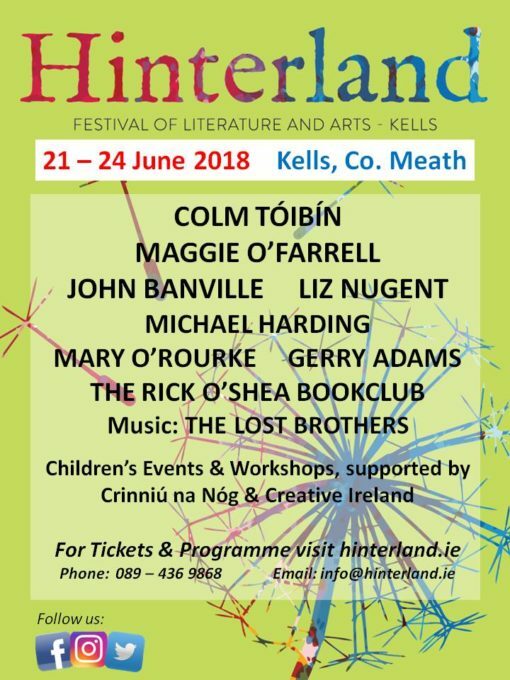 The Hinterland Festival of Literature and Arts takes place this weekend 21st to 24th June in Kells, Co. Meath. Literature, sport, history, cookery, politics, journalism, architecture, the law, music, travel, security feature in the programme. In addition to literary guests such as Colm Tóibín, John Banville, Lisa McInerney, Liz Nugent, Frank McGuinness, Maggie O’Farrell, Michael Harding and John McKenna, the Rick O’Shea Book Club will feature for the first time. Rick will be discussing Oh My God What a Complete Aisling by Emer McLysaght and Sarah Breen with four onstage critics – the authors themselves will talk about their best-selling book on Saturday morning.